Tickets for The Book of Mormon officially go on sale on 1 September, 2012. The Book of Mormon London – Tickets. “The Book of Mormon is a religious satire musical by the team of Trey Parker, Robert Lopez, and Matt Stone. Trey Parker and Matt Stone are best known for creating the animated comedy “South Park”. Robert Lopez is co-creator, composer and lyricist of Avenue Q, which won 2004 Tony Awards for Best Musical and Best Score. 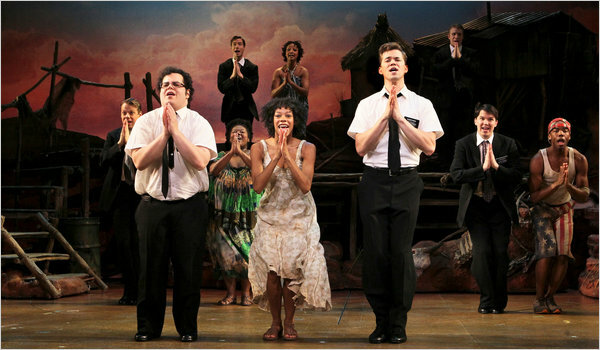 The Book of Mormon, which premiered on Broadway in March 2011, satirizes organized religion and musical theatre. The show is about two naive missionaries who venture from Salt Lake City to AIDS-ravaged Uganda in the hopes of converting villagers with the story of Joseph Smith and the founding of the Mormon Church. The duo is not prepared for what they find in northern Uganda: Warlords, famine, AIDS and cynicism. They begin to question their faith which, in turn, threatens to break up their partnership until a young woman chooses to believe their promise of salvation and persuades the village to listen as well. The most valuable and entertaining lessons are the ones that these two learn along their journey. The show has garnered numerous awards, including nine Tony Awards. This entry was posted in Book Tickets Now!, Other London Things, Theatre and tagged Book of Mormon, Tony Award. Bookmark the permalink.